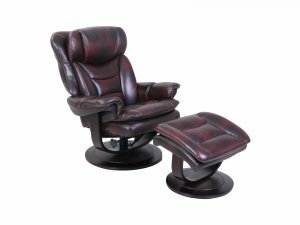 Generously scaled 360 degree swivel pedestal chair with reclining back with endless positions and matching angled ottoman for superior leg support. Features articulated head rest area, split back and seat design, and plush shaped tucked arms. Wood base is finished in a rich cappuccino color.